Over the last few months I have not been doing much guiding so I was looking forward to a few days on Lough Sheelin with Azim Curimjee, who was flying all the way from Mauritius for his annual mayfly trip. On arrival we were met with the worst possible weather. 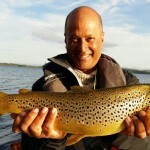 North easterly gales and lots of rain, not ideal conditions for Azim’s favourite style of fishing, the dry fly.. When we got there we met my good friend local guide John Murphy. He was fishing with Dubliner John Reddin. Both decided to try wet flies and fish close to the islands near John’s lakeside home. 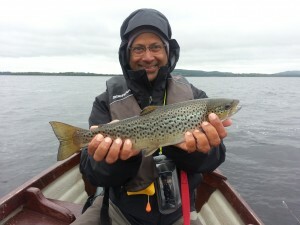 Azim and I headed up the lake from our base at Crover and despite the bad weather there were plenty of Mayfly on the water. On the first drift Azim turned a good one, and then he got a small fish on a wet mayfly on the tail. With such high winds it was impossible to fish the dries correctly..
An hour or so later we hooked a good fish out in the open water and unluckily it smashed the cast.. Then the phone rang, it was John Reddin. He had caught a real beauty, of nearly 6 pounds on a Golden Olive Bumble. This turned out to be the first of a number of good fish he took over the few days. By 6 pm the winds had got so bad we all headed in and decided to wait for the morning, hoping they would ease..It was to be a long wait!! Over the next few days we fished really hard, from early morning until dark of night. The fly did its best and at times there were lots of greens on the water and fish did come up and feed. 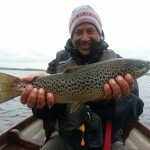 Azim had some good sport using some small Green Wulff patterns mostly in the shallower water towards Orangefield. The fish were hard to find but if you got the flies over them quickly there was a chance of a take. The Sheelin fish are really great fighters and at times we thought we were into some real big ones. Azim was unlucky on two occasions to lose fish upwards of 4 pounds. John Reddin went on to catch some more great fish from 2 to 4.5 pounds. A fish to the Wulff. As time went on the weather improved and on the last evening some Spent went out. This is Azim’s favourite and he quickly changed to a Turrell Spent, one of his most trusted patterns. Normally when the Spent go out there are thousands of them on the water, but numbers were low and only an odd fish came up..
At about 8 pm Azim got the chance he was waiting for. A fish came up ahead of the boat and when Azim put a fly on its nose, it buried it. The fish spent the first few seconds in the air, and then typical of Sheelin trout, it stayed deep until it tired for the net. 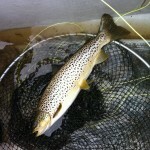 Luckily the fly was well in, and soon we were looking at a lovely Sheelin trout of 4.75 pounds. Normally we would have called it a day but we fished on into dark. When all the other boats were gone and not a fly was left on the water, Azim hooked one of the biggest fish I have seen from this lake. It took him in about 2 feet of water and thrashed on the surface to give us a great look at its size. After getting the fish on the reel it just circled the boat, and then unexpectedly, threw the fly. Azim was gutted and simply reeled in and we headed for the shore. It would have been a great end to a tough but enjoyable few days. Footnote: Losing the big fish must have stirred Azim because a few days after he left Ireland, he called to see how the fishing was. He was in Germany and had a few spare hours the following friday before flying back to Mauritius and was considering a quick trip back. When he arrived in Dublin he drove straight to Sheelin. There he teamed up with John Murphy and they spent an evening in the bay where he had lost the big one. Not one to give up, and despite the cold, he got his chance at 10.45 pm. John saw a fish move and put Azim over it and again the Spent did the trick. Another good fish, this time a beauty of 4.5 pounds and one that was well deserved for all the miles traveled. John Reddins near 6 lb fish before release. 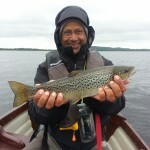 Azim with a 4.75lb Sheelin trout caught on a spent. 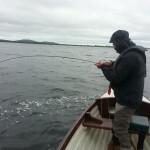 This entry was posted in Guiding, Uncategorized and tagged Crover House Hotel, Golden Olive Bumble, mayfly, Orangefield, Sheelin, Turrell Spent. Bookmark the permalink.